DEMO: This item has been used for demonstration purposes in the TMS Showroom. Includes: Ki Drive 250 (250GB 7200 rpm Storage Module), FW800 cable Ki AC Adapter (AC to 4-pin XLR). 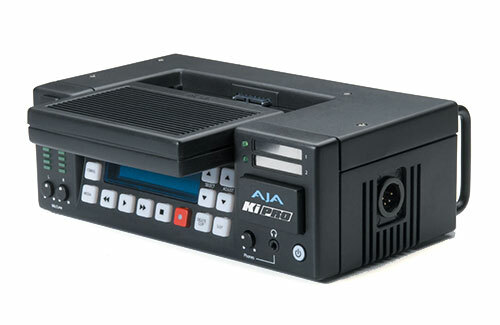 The AJA Ki Pro is a tapeless video recording device that records high-quality Apple ProRes 422 QuickTime files onto computer-friendly media. Because it features SD/HD-SDI, HDMI, and analog inputs, you can interface with virtually any type of camera you might own or rent. Enjoy monitoring flexibility through Ki Pro’s numerous simultaneous outputs, connecting to both professional and consumer monitors. Eliminate the cost and inconvenience of logging and capturing footage. Ki Pro produces Apple ProRes 422 QuickTime files that are ready for immediate use within Final Cut Studio [(Apple ProRes 422, Apple ProRes (LT), Apple ProRes (Proxy) and Apple ProRes 422 (HQ) supported]. Simply connect the media to a host computer and begin editing. Unify SD, 720 and 1080 cameras and formats with one superior 10-bit full-raster codec—Apple ProRes 422. Ki Pro features cross-conversion so you can have a 720p camera produce a 1080i recording to match your other camera... or vice versa. And if you’ve got highquality SD cameras, Ki Pro can even help you extend their use since it also up-converts SD camera signals to HD recordings. No more digitizing; No more worrying about which camera to use; High-quality ready-to-edit video. Ki Pro is portable and rugged; designed for a variety of production environments. Powered through an industry standard 4-pin XLR, you have flexible AC and battery options. An optional exo-skeleton can be used with your camera and tripod—complete with sliding baseplate and slots for 15mm rods. Capture the full quality of your camera by tapping the direct uncompressed camera outputs. Connect any digital camera or VTR via component analog, SDI or HDMI to Ki Pro. Balanced and unbalanced audio connectors, LTC input/output, and even LANC, are provided. By bypassing tape or recordable media compression, Ki pro maintains the best possible image quality your camera produces. From acquisition to delivery, use the codec at the core of Apple’s Final Cut Studio suite of applications. Ki Pro supports an Apple file-based workflow by recording standard Apple ProRes 422 QuickTime files on industry standard media. Record to removable 34mm ExpressCards, or a removable HDD Storage Module containing a hard disk drive (standard) or an optional SSD Storage Module with a solid state disk. When removed, the Storage Module functions as a standard bus-powered FireWire 800 drive. If bus power is not available, the Storage Module has a standard DC power connector for a user-supplied AC power adapter.